A few years ago, back when EJ was still a baby, my SIL put play makeup on her daughter's Christmas list. I went to the store and bought the biggest set I could find (because I'm a spoiler Auntie like that) and then got in trouble because the "play makeup" set had actual makeup in it. The thing is, that was the only option. There wasn't any pretend makeup, only makeup packaged for kids, so when I saw this tutorial I knew I had to give it a try! I made sets for my girls and a couple friends this summer and it was so simple. So this week, I decided to make a few more kits for my nieces (to maybe make up for my mistake) and I thought I'd share the process. They make a perfect gift and the holidays are on their way. So, the first step is shopping! I bought cheapo makeup from Target and most of the items are just $1 so it is pretty cost-effective. Don't shop based on the color of the makeup as that won't matter, but make sure you like the makeup cases. For instance, the elf blush compacts have a mirror in the cover of the case, so that's a little bonus. 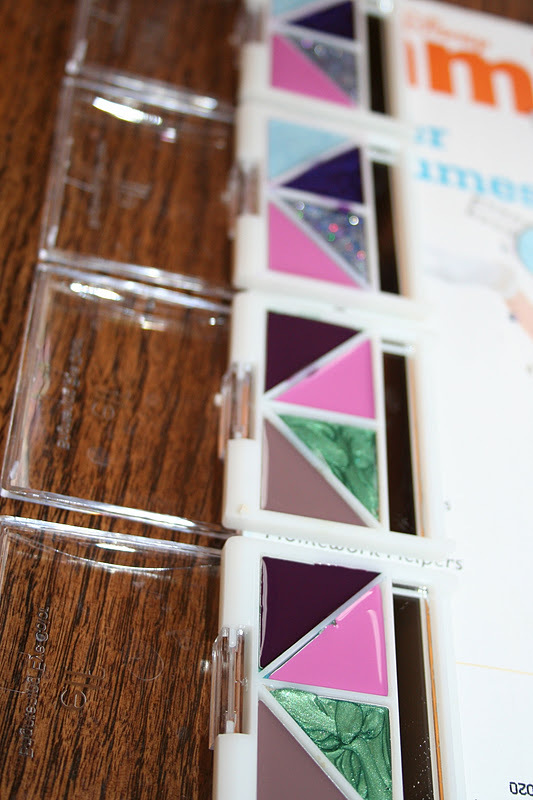 Once you have picked out the makeup cases, you need to purchase nail polish to make the "faux makeup" (clever right?). The nail polish shrinks as it dries so you should plan about one bottle of nail polish for each powder or blush compact. The eye shadow uses a lot less but it will depend on the brand/style of compact. I also picked up a couple brushes for each set. Everything fits perfectly (in other words a really nice place to tuck everything away) in these cute personalized pencil cases too! Once you're home, the first step is to remove all the actual makeup from the compact. I use a plastic fork (I'm so fancy) to break it up and get into the corners easily. Then I wash the remaining makeup out with dish soap and let the compacts dry overnight. Next, you fill them back up with nail polish and let dry. A small trick I figured out was to use a magazine to prop the compacts on so they lie flat. Line the hinge up with the spine of the magazine whichever way works the best for that particular compact and line them up in a row so that you can move easily between them (less spills). If the nail polish isn't going to the edges/corners, you can use the brush to move it or tipping the compact slightly works as well. After the nail polish has dried (in 8-12 hours it will be dry but tacky) it will shrink up quite a bit. You will need to "top off" each compact with nail polish (you may want to do this a third time, but remember that the makeup doesn't need to look full to the brim either). The best part of needing to add additional nail polish is that if you do accidentally spill the wrong color, you can fix it when you top off that section. When you are happy with the compacts, you can choose some nail polish bottles that are almost empty (make sure you choose fun colors) and leave the tops off so they dry out as well. This takes a little longer (maybe 48 hours) than the compacts, but is worth it as it makes a fun addition to the set. 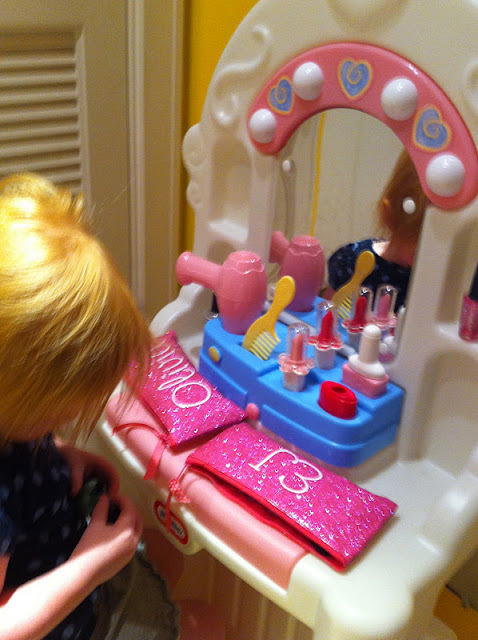 The makeup set is one of the girls' favorite toys. They just love it (and I'm certainly not setting the "primping" example or usually encouraging this type of gender-specific play). In fact, they could sit at the vanity (thanks again for this much-loved toy Leslie) for hours and play makeup and do nails...everyone's nails. Love. This has my girls names written all over it. Thanks for sharing. I've had my nails "painted" many times by the girls. Definitely a favored activity. That is SO CLEVER! I love it! What an awesome idea I'm definitely doing this... thanks for sharing!!!! This is such a cute idea! Real make up spells trouble, or at least very clown-like faces at our house. Olivia is sooooo cute in the poncho pics below!